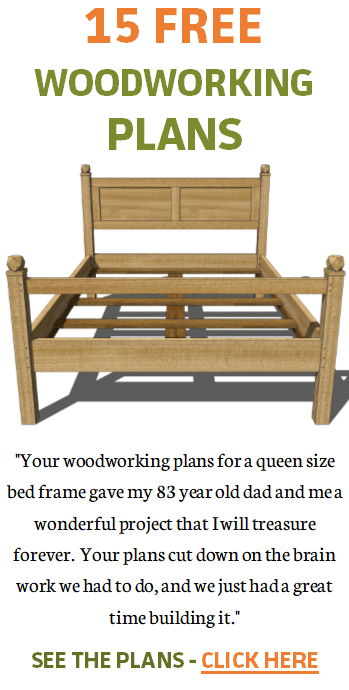 My woodworking project has taken a back seat to some pretty significant events for our family. I mentioned in my last blog post that a major family wedding was about to take place. Now that the wedding has come and gone, I think the word “major” is not the best word to describe the wedding. Better: ARE YOU KIDDING ME? I have been to some big weddings in my time here on Earth. This one ranks as the best. My wife, daughter and I had to fly to Baltimore, Maryland, rent a car and drive to Kent Island, Maryland which is just across Chesapeake Bay from Annapolis. We arrived a day early to do some sight-seeing. The wedding was held at the Chesapeake Bay Beach Club. 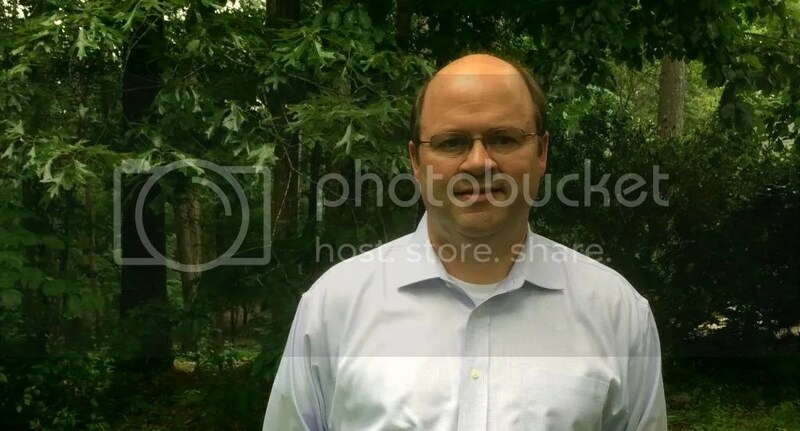 Click the link and let the image slider do its thing. It was a great venue for a wedding; food and beverages were non-stop and I even danced some. When we returned home, only a few days passed before I decided to quit my job of 16 years with Mohawk Industries. I will soon be working as a sales representative with a smaller competitor; Beaulieu America. The process from first contact with Beaulieu to my acceptance of the job took about four long weeks. Along the way, there were moments of excitement and times of uncertainty; a nerve-wracking time for sure. But I pulled the trigger and I start my new job tomorrow, which means I have been unemployed for a week. I had planned to get some major work completed on the window seat bookcase, but even though I have not been working, in reality, I have. 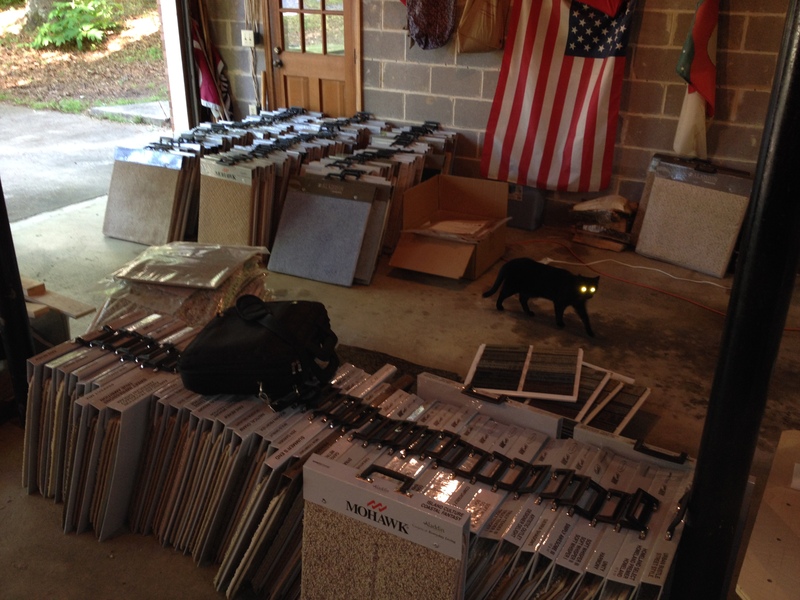 New hire paperwork, getting rid of my old carpet samples and moving in the new ones, buying some new clothes (I had accumulated a large collection of Mohawk logo shirts, sweaters and jackets), and re-organizing my basement took the better part of the week. Mohawk samples being moved out. New Beaulieu samples moving in. Both photos above show only about 75% of the samples I moved out and probably 70% of the samples I received, and I received more than I got rid of. 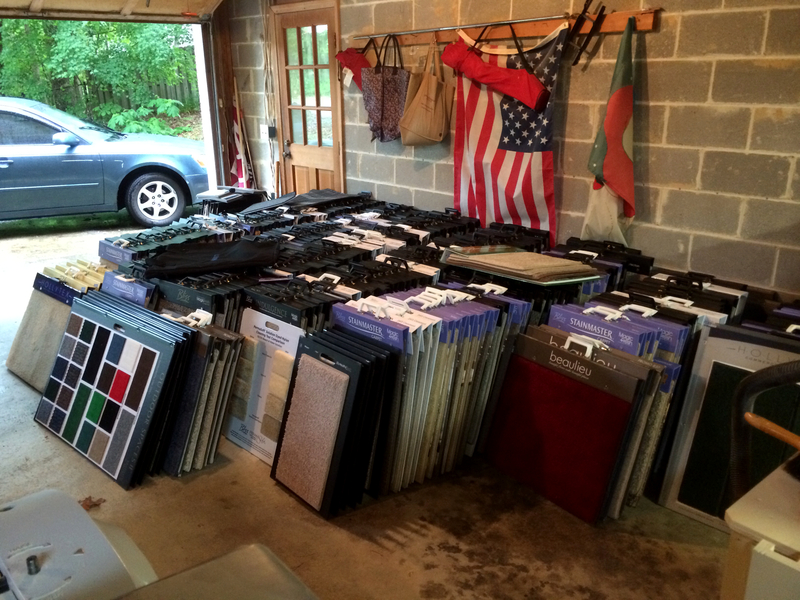 I estimate I have more than 300 carpet samples in my basement. At present some of them are on my workbench and table saw. Others are leaning against my router table and planer cart. There is still a lot of organizing to be accomplished and woodworking is basically on standby for now. I had my 54th birthday this past Thursday. I did get a little woodworking completed. I bought another nice piece of cherry, used my jointer plane on it and started making some basic cuts for additional bookcase components. 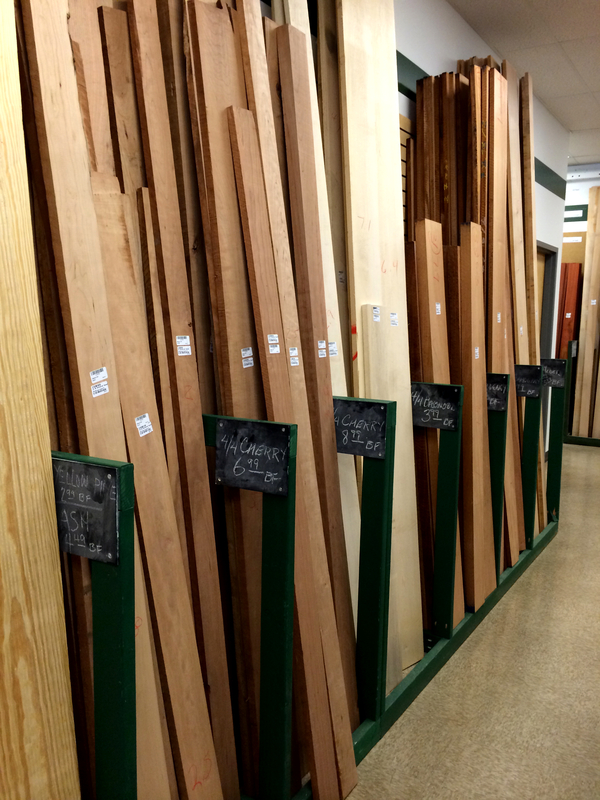 Some very nice cherry boards at the Pelham, Alabama Woodcraft store. Speaking of components, I took the time to add some of the joinery to the bookcase SketchUp model to ensure I did not make a mistake. Congrads, on the new job and good luck. As usual I have been following your woodworking and the bookcase sketchup of it looks great. Scott – thanks for the support! I haven’t been around for awhile, lots happening in life here as well. New house purchased, back injury in Sept took me out of the woodworking game for a bit, but now with the new house, and a nice huge garage with room for the woodshop I’ll be heading out to build once again. Always look forward to your posts, and def want to see more of the window seat. We have a walk up attic in our new house that we want to convert to a master suite that has 2 great dormer windows that will take a very nice window seat on each side! Keep up the great work and good luck on the new job! As much as I like the Woodcraft store I find them to be really expensive compared to buying rough sawn material elsewhere. The extra work is really worth it to me and the prices are always better. Do you have that option near you? Dave – I have a hardwood supplier that is about a 45 minute drive, there and back. That isn’t bad, and I do plan to buy from them for this project, but I will wait until I am heading that direction. Thanks for the kind words about my new job! Good luck with the new job, look forward to the window seat in the near future. Good work, it is nice to be doing something you really love. Congratulations & good luck with the new job. Leslie, Dyami and RRW – thanks! November of 2003 I retired from Rockwell Automation with 25 years of service. I then took a new job and have been there 11 years. As of last week I am 57, my decision to leave Rockwell was one of my best decisions ever.